Martinique (pop 414,500) flourishes as a tourist destination, with an average per capita income of US$10,700, catering almost entirely to the French market. It is one of France's two Caribbean 'overseas departments' (DOMs) with Guadeloupe as the other one). Martinique is extremely beautiful, particularly the East Coast which has a wild, unexplored feel, like the Grenadines, without all the yachts. It still has that getaway feel, in a Caribbean which is increasingly built-up. There is nice landscape, bananas, sugarcane, pineapple fields. Unlike St Lucia, the middle of the island of Martinique is very quickly and easily accessible, and it is easy to see very interesting geography. And then there is very good food. "Prices have gone astronomical," says Douglas Rapier of Atout Immobilier in Fort de France Martinique. This is one of the results of the Loi Girardin, which allows 40% of a property purchase cost to be written off against future tax payments. "Prices here have gone above the capacity of ordinary people to bear. In the past three years, real estate prices have risen by around 20%," Rapier estimates. Average prices have, in fact, risen above the maximum Loi Girardin limit of €2,025 per sq. m on the interior living area (which includes 14 sq. m. of balcony). Land prices have also greatly risen. Martinique property prices have somewhat fallen. The current average price per square metre of properties in Martinique is US$3,600, while last year it was US$4,100. The downward trend in property prices is observable for Fort-de-France apartments and houses, as well as for apartments and houses located in the coastal areas such as Le Diamant, Les Trois-Îlets, Sainte-Anne, and Sainte-Luce. The decline in prices, however, has not fully been reflected in lower rents. So rental yields of coastal apartments have risen from 4.35% to 5.48%. An 80-sq m apartment last year earned ‘poor’ rental yields of 4.20%. The same apartment might today earn ‘moderate’ rental yields, of 5.16%. Our sample size of houses this year was small, and we did not have enough cases to sample house rents. Martinique’s tax system exactly mirrors that of France. Capital Gains: EU residents and residents of France now pay 16% on the net gain, after inflation relief, and after deduction of acquisition and improvement costs. Non-residents of an EU country pay CGT at a rate of 33.3%, subject to any applicable double tax treaty. Total round trip transaction costs , i.e., the cost of buying and selling a property, range from 16% to 27% for old properties (more than 5 years old). New properties without previous resales have round trip transaction costs of 27.6% to 44%, because of the 15.4% VAT. Notary fees for old properties are fixed at 8%, but range from 2% to 5% for new ones. 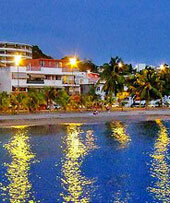 Martinique follows French tenancy law, which is very pro-tenant. Martinique (pop 414,500) flourishes as a tourist destination, with an average per capita income of US$10,700, catering almost entirely to the French market. It is one of France’s two Caribbean ‘overseas departments’ (DOMs) with Guadeloupe as the other one). After the French revolution, many of Martinique’s French aristocracy were executed, which gave breathing space to the middle-class and partly in consequence Martinique is more dynamic and less liable to independence movements than Guadeloupe. Departments are integral parts of the French Republic. French taxes apply, and French citizenship rights are given. The Departments send representatives to the National Assembly, the Senate, and elect a member of the European Parliament (Martinique is now represented in the French parliament by four deputies and two senators). They also use the Euro as their currency. Martinique is getting ready for international investment. Previously, Martinique gave quite a cold shoulder to tourism. There is definitely a feeling that Martinique should be moved toward high-end tourism. The quality of housing is very good. Martinique is extremely beautiful, particularly the East Coast which has a wild, unexplored feel, like the Grenadines, without all the yachts. It still has that getaway feel, in a Caribbean which is increasingly built-up. There is nice landscape, bananas, sugarcane, pineapple fields. Physically, you can also easily get into the island unlike St Lucia, The middle of the island is very quickly and easily accessible, it is relatively easy to see very interesting geography. And then there is very good food.